The following article was presented at International Conference on Complex Systems in June 2002 (view proceedings) and accepted for publication into the InterJournal of Complex Systems, Report, 535 (2003). An understanding of structural and functional characteristics in a complex network requires a detailed map of the network’s components and interconnections. Data sets representing the Internet, World-Wide-Web, scientific collaboration networks, and biological processes have been used to analyze these systems’ network characteristics. However, there has been a lack of sufficient architectural data for another interesting complex network system: interconnected neurons. We present a method of automated digital image analysis to extract critical network properties from a cultured neuron network. Our data collection software provides information for mapping cultured neuron systems, which will later be systematically compared to the functional characteristics of neuron devices with similar network structures. The neuron by itself, although a complicated beast, has limited computational power. It is through the neuron communicating with other neurons that the behaviorisms of the brain arise. In fact, it is the complexity in thestructural composition of these networks that reflects the complexity of the brain’s function , and provides its computational power. The complete function of a neural system cannot be understood without a realization of the structure of that system. We propose to experimentally explore the structural connectivity in a cultured neural system as a first step toward combining structural and functional information to better understand the network’s computational behaviors. The current focus is to quantitatively characterize the resulting spatial pattern of a cultured neuron network. It is anticipated that this sort of characterization will form the foundation for later work with cultured neuron systems involving (1) the determination of the range of architectures that develop in these systems, (2) a systematic study to determine how the complex spatial patterns affect the functioning of the system, and (3) the exploitation of these characteristics for fabricating functioning prosthetic neuron devices. Here, we describe the initial development of an automated image processing system that provides a quantitative characterization of the structure in cultured neuron networks. Unguided cultured neurons on 2-D surfaces typically appear to form random networks where the cell bodies and their branching processes are haphazardly organized throughout the system (Figure 1). We can acquire digital images of these self-organized complex networks and extract quantitative structural information. In other words, we want to allow cultured neurons to grow and interconnect without any external patterning or control, then characterize the resulting network. Of course, there are many complications and details that affect how neurons grow and interconnect. Chemical, physical, and electrical cues can all influence the development of a neuron network. In addition, neurons can interconnect in ways dependent on the type of cells involved. Some types of neurons might form preferential connections or avoid connections with other neurons. However, we will ignore all of those complications and only look at the end result: the final network architecture. In particular, we will map the location and distribution of each neuron cell body, or soma, along with its extending axons and dendrites (collectively referred to as neurites). We will also extract a count of the number of neurites in the network system, neurite lengths, their endpoints, and which soma’s are potentially interconnected via which neurites. As mentioned above, the cultured network tends to be messy: neurites may grow across one another, or there may be glial cells (if present in the culture) forming insulating sheaths around the neurons. The complexity of the neurons’ interconnections can hinder the effectiveness of optically mapping the network architecture. However, several techniques are available to help clarify the network mess. 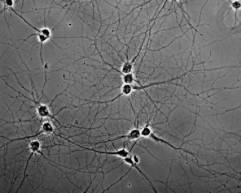 Initially using very low density neuron cultures will help lessen the complexity of the network. Of course, the concern here is entirely economical: fewer neurons should reduce the difficulty of mapping the network. In fact, the sample data presented here comes from a low density and underdeveloped cultured neuron network. This data was selected to provide a starting point for developing the analysis software since only the basic characteristics of a neuron network are present. However, low density cultures will only be used as a testing ground for our image analysis development. The goal is to eventually study functioning, self-organized neuron networks in culture. Restricting the density of neurons is essentially applying a patterning control that might limit how neurons naturally form functional connections. Next-generation versions of the image analysis routines described below will systematically incorporate capabilities that will directly deal with more complicated network structures found in higher density neuron cultures. In order to further clarify the complicated interconnections, certain dying techniques can be employed to distinguish the various components of the network by visually separating one neuron’s processes from another as demonstrated in Figure 2. Depending on the staining technique employed , specific structures of the neuron can be identified. For example, stains exists that will only mark the soma, the dendrites, axons, or synapses. Even a blanket stain of every neuron in the culture, as is used in our sample data below, simplifies the image analysis of neurons and their interconnections by significantly enhancing the contrast between neurons and the background. The procedures for growing and maintaining neurons in culture will not be described here. However, more information regarding the many techniques associated with nerve cell culturing in general and those specific issues related to culturing on silicon devices may be obtained in References  and . Assuming a neuron culture has been grown and is prepared for imaging, the actual mapping of the network can be accomplished with a reasonably simple experimental setup composed of a digital image acquisition system coupled with automated image analysis. A CCD camera connected to a computer with an image acquisition card can be used to image the entire culture with high-resolution. Image acquisition software can collect the images and send them through to the automatic image analysis being developed for this research. Automated digital image analysis can be used to quantitatively characterize the structural map of cultured neuron networks. Here, we show the initial implementation of standard image processing routines  specifically customized for identifying soma centroids, the extending neurites, neurite lengths, and potential neuron connections. Our image analysis software is currently capable of sorting through a sparse cultured network as in Figure 3. The image processing we have implemented to date requires one primary assumption: the largest region in the image containing the maximum pixel intensity (a pixel value of 255 in a gray-scale image) represents the region containing the soma centroid. To ensure this condition, we pre-process the image with a scaling routine setting the present maximum pixels to a value of 255 and the other pixels to a correspondingly-scaled intensity value. Although 255-valued pixel intensities are often found in regions representing a neurite, the soma will in generalcontain a larger area of nearest-neighbor 255 pixels than in the neurites. This assumption will allow us to distinguish the soma region from the surrounding neurite regions (see section 1.4.3 below). Figure 5 outlines the step-by-step processing of the following image analysis routines on one example neuron image. The image optimization step is the most critical for accurately identifying the detailed features of single and interconnected neurons. This routine takes a gray-scale version of the neuron image, which contains pixel values ranging from zero through 255, and converts it to a binary image of only two pixel values: zero and 255. The optimization occurs by selecting a threshold pixel value that distinguishes neuron features from background or noise features. For the sample data set in Figure 3, typical threshold pixel values were found to be optimized around 30 to 40. Applying this threshold converted all pixel values below the selected level to “black” (zero pixel value), and all pixel values above the threshold to “white” (255 pixel value). This threshold selection can successfully distinguish the majority of neuron features; however, additional noise features from the background may still remain. To further optimize the image we perform a “filling” routine that evaluates the immediate neighborhood of each pixel in the binary image. If a pixel is surrounded by oppositely-valued pixels, then the evaluated pixel is switched to that of its neighbors. This routine removes the noisy speckles of “white” pixels and fills in missing pixels within the neuron features, providing a method to fine tune the detected details of the neuron image. Soma centroid identification relies on our primary assumption described in section 1.4.1. We filter the original gray-scale neuron image with threshold pixel value of 254, thereby leaving only the maximal 255 pixels. It is possible for more than one region of 255 pixels to remain after the filter, so the region representing the soma must be detected. To implement the soma centroid detection, a separate contour is traced around every 255 pixel region and the centroid of each is determined. The pixels within these contour regions are summed, and the region with the highest number of pixels (and the corresponding contour region’s centroid coordinate) is selected as the representation of the neuron’s soma. Before completing the process to identify the neurites, the selected soma region must be removed from the image. The selected pixels representing the soma region in the image are subtracted from the optimized binary neuron image. If we do not perform this soma removal, then the next step of neurite identification will result in false neurite features (see Figure 4). The remaining pixels are “thinned” to single-pixel-wide features using a standard routine often used for identifying unique features in digital images of finger prints. For our application, this routine results in an outline of the soma region along with a single-pixel-wide representation of each neurite. To remove the soma outline, we start from the soma centroid coordinate and virtually fill the region with 255 pixels out to the existing boundary. This procedure, of course, only needs to be implemented as a subroutine, and does not require an output image. Each of these filled pixels in the region, including its boundary, are subsequently removed (i.e., converted to “black” or zero-valued pixels) leaving only the identified neurite features. (a) Original gray-scale neuron image. (c) “Thinning” the neuron image without having previously removed the soma. Notice that a false representation of the neurite structure is made. (d) “Thinning” a neuron image after removing the soma. Each neurite has been properly identified. Figure 4. Example of “thinning” a neuron’s feature without removing the soma. After the neurite features are identified by thinning the binary neuron image, the remaining 255-valued pixels are encoded as ‘primitive chains.’ This procedure collects neighboring pixels and represents these grouped configurations with code words. In essence, the chain coding represents the connectedness of an isolated group of pixels, which is a natural framework for the identification of neurite features. This coding mechanism allows for the identification of lines, feature endpoints, bifurcations, junctions, and other types of line breaks. The codes are collected into “structures” that each represent a single neurite or a collection of interconnected or overlapping neurites. Since these codes also identify endpoints, we can automatically extract the lengths of neurite structures. With the soma centroid and neurite endpoints identified, each endpoint is associated with the nearest soma coordinate. If a single neurite structure contains endpoints associated with two or more distinct somas, then we grossly assume the somas are potentially connected via that neurite structure. Although this potential interconnection is actually composed of two or more neurite structures, we are currently not able to distinguish between the individual neurites forming a connection, since the primitive chain encoding, described in section 1.4.5, only identifies single, interconnected line structures. Future improvements and modifications to our image analysis will include a tracking mechanism to follow a neurite from its soma of origin and continually distinguish it from other neurites it might overlap—but not connect to—along its path. Of course, it is imperative to realize that just because a neurite structure contains endpoints associated to distinct somas (i.e., two neurites are apparently touching at some junction), this does not guarantee an electrical—or functional—connection. An actual interconnection between two neurons will only occur at a synaptic junction, where the synapse of one neuron is connected with a receptor on another neuron. Staining techniques are available to identify synaptic connections, and will be used in future mapping studies to more accurately identify actual connections in cultured neuron networks. However, the current mapping goals of characterizing the network architecture do not require the precise identification of synaptic junctions, since we will not immediately be comparing to the electrical data of the neuron network. (a) Original gray-scale image of an isolated neuron from Figure 3. The maximum intensity pixels are present in majority on the soma, although a few reside on the neurites. (b) Binarization and noise reduction creating an optimized binary representation of the neuron. (c) A filtered image containing only the maximum intensity pixels from the original image. (d) A contour of the regions from (c), along with these regions’ centroid locations. The largest contour region is assumed to be part of the soma, therefore the centroid of this region corresponds to the neuron centroid. A step-by-step view of the automated digital image analysis routine for identifying a neuron and its neurites. (e) Subtraction of the soma’s contour region of (d) from the binary representation of the neuron, (b). (f) Thinning performed on the binary image of (e). The remaining, single-pixel-wide features represent the soma boundary and the neurites. (g) Removal of the soma boundary pixels by selectively filling the interior region out to the soma boundary, then removing those filled pixels. The remaining features represent the identified neuron’s neurites. The fundamental hypothesis that guides our approach is that the specific network architecture directly determines the functional characteristics of an interconnected neuron system. By comparing the resulting network map of a large number of similarly-prepared cultures, we will explore how these self-organized networks structurally develop in similar ways. Initially, we will look at static images of the final structural pattern formed at some stage in a neuron network’s development. Later studies will include a coupled automated image acquisition and analysis system for time-lapse studies of self-organized neuron network development. To study the network properties of cultured neuron systems, we need a set of characteristics to apply to the quantitative data we obtain from our image analysis. Over the past several years, there has been a growing interest in analyzing the structure-function relationship in complex networks that we encounter everyday. Examples of real world network systems that people depend on include electrical power grids that keep the lights on, the Internet backbone that transports our e-mails, and of course, our brain that keeps us thinking! In addition to the seminal work on random networks by Erdös and Rényi , new models of mechanisms for network interconnection have been proposed, including small-world networks , scale-free networks , and generalized random graphs . These specialized networks are purported to more closely display the structural characteristics found in data from real world networks. In particular, these models have been used to calculate important functional characteristics, including the vulnerability of communication between network components to either random component deletion or targeted attacks ,,,. From all of these efforts to better understand the nature of complex networks, there is a growing “toolbox” of mathematical models used for characterization (see Reference 1 for a complete review). We will mention only a few that may be applied to our sample data presented here. The components of an arbitrary network could be connected to one another in an infinite number of ways (especially if there are no spatial constraints on the pattern of interconnections), presumably presenting a gargantuan task for mapping its precise structural makeup. We can start, however, by defining a network as a set of nodes, i, and edges. Nodes refer to the component that is interconnected to other components, say neurons in the brain or web pages in the World-Wide-Web. An edge is the actual link that connects two nodes, say neurites or hyperlinks. Figure 6. An imaginary, sample network with eight nodes randomly interconnected with one or more edges. The total number of edges, or links, emerging from a node is called the node’s degree, k. As an example from Figure 6, i = 1 has degree k = 2 and i = 6 has k = 5. To quantify how nodes are interconnected differently throughout the network, we use a degree distribution, P(k), which defines the probability that a randomly selected node has k edges. We can use this distribution function as the key quantity to define how a network is organized. There are many additional mathematical representations for describing complex networks, including clustering coefficients and network diameters. However, since we are only presenting a sample data set to demonstrate our empirical method for data collection, we will only focus on this basic characterization of degree distribution. From the sample self-organized, cultured neuron network in Figure 3, we have extracted examples of quantitative data from our automated image analysis software. Similar information in larger and/or a statistical sampling of cultured neuron networks can be used to make meaningful characterizations of the networks’ architecture. Figure 7presents the soma centroid locations, which might be used when searching for clusters of neurons or potential regions of sub-networks. Figure 8 contains the degree distribution for our sample data, featuring an average node degree of roughly 4. Although only limited conclusions should be inferred from this sample data, it can be noticed that there are significantly fewer number of neuron nodes with a large number of edges, and a majority of nodes with 2-6 edges. This could be the beginning of a network that might develop with a scale-free, or power-law distribution in node degree. This network property—most nodes have only a few connections, but a small number of nodes form many connections—has been experimentally measured in apparently randomly networks like the World Wide Web, but which also exhibit network expansion and preferential attachment . Figure 7. A plot of the actual coordinate of each soma centroid found in Figure 3. At first glance, it might be assumed that the distribution is random, however clusters of nodes might be apparent. Figure 8. The distribution of node degree from the sample data set. There are only a few neurons with a large number of extending neurites (8-11), with the average node degree, <<k> = 4.2. For comparison, a randomly connected network would result in a Gaussian distribution in node degree . Two-dimensional cultures of networked neurons do not perfectly resemble the biological environment found in naturally occurring three-dimensional systems (e.g., the human brain), since many of the developmental, physical, and chemical cues found in vivo are not present in culture. The self-organized pattern of neurons and their interconnections in culture cannot take advantage of these in viv-only guidance mechanisms to form a network with comparable functional capabilities of an animal brain. However, two-dimensional patterning technologies dominate the current attempts for neuron device fabrication ,,, , and we are ultimately interested in harnessing the computational power of neural networks. So, although any conclusions drawn from network studies of neurons in culture may be limited to comparison of neurons in vivo, it is critical to have a quantitative measure of the self-organization of cultured neurons in these unnatural 2-D environments. Much work has been focused on successfully maintaining living neurons on electrically-interfaced silicon devices ,. In order to design advanced neuron devices, a patterning methodology for harnessing the computational power of biological networks is necessary. This can be accomplished through the analysis of observed network structural characteristics for the development of appropriate controlled neuron patterning techniques. Therefore, the expectations of network structure analysis are at least twofold: (1) it should provide data for a systematic study to determine how the complex spatial patterns affect the functioning of the cultured neuron system, and (2) it should allow for the exploitation of this structure-function relationship for the technological development and fabrication of electrically interfaced neuron devices. Whatever type of network structures are experimentally found in cultured neuron networks, the next step would be to explore how the specific architecture relates to the resulting functional properties of the neuron circuit. These properties might include, for example, inter-neuron electrical pulse firing rates, firing durations, and the spatial and temporal distribution of these communications throughout the network. From the detailed architectural information resulting from digital image analysis coupled with measurements of electrical activity in these networks, we might begin to develop a more complete picture of the structure-function relationships of networks in two-dimensional, cultured neuron systems. Special thanks to Prof. Harold Craighead, Prof. Ron Harris-Warrick, Andrea M. P. Turner, and Conrad James for their reviews and input. Additional thanks to Prof. Gary Banker and Andrea M. P. Turner for providing images of cultured neurons for use in this work. Research supported in part by Cornell’s IGERT Program in Nonlinear Systems (funded by National Science Foundation grant DGE-9870631). Albert, R., Barabási, A. L. Reviews of Modern Physics 74, 47 (2002). Tessier-Lavigne, M., Goodman, C. S. Science 274, p. 1123 (1998). Koch, C., Laurent, G. Science 284, pp. 96-98 (1999). Banker, G., Goslin, K., eds. Culturing Nerve Cells, 2nd Ed. (1998). Stenger, D. A., McKenna, T. M., eds. Enabling Technologies for Cultured Neural Networks. Academic Press, NY, NY (1994). Seul, M., O’Gorman, L., Sammon, M. J. Practical Algorithms for Image Analysis. Cambridge University Press, NY, NY (2000). Strogatz, S. H. Nature 410, pp. 268-276, (2001). Erdös, R., Rényi, A. Publ. Math. Debrecen 6, 290 (1959). Barabási, A. L., Albert, R. Science 286, 509-512 (1999). Newman, M. E. J., Strogatz, S. H., Watts, D. J. Physical Review E 64, 026118 (2001). Albert, R., Jeong, H., Barabási, A. L. Nature 406, 378-382 (2000). Cohen, R., Erez, K., Ben-Avraham, D., Havlin, S. Physical Review Letters 85, 4626-4628 (2000). Cohen, R., Erez, K., Ben-Avraham, D., Havlin, S. Physical Review Letters 86, 3682-3685 (2001). Callaway, D. S., Newman, M. E. J., Strogatz, S. H., Watts, D. J. Physical Review Letters 85, 5468-5471 (2000). Barabási, A.-L., Albert, R. Science 286, pp. 509-512 (1999). Tatic-Lucic, S., Wright, J. A., Yu-Chong, T., Pine, J. Sensors and Actuators B B43, 105-109 (1997). Bayliss, S. C., Buckberry, L. D., Fletcher, I., Tobin, M. J. Sensors and Actuators A A74, 139-142 (1999). James, C. D., Davis, R., Meyer, M. Turner, A., Turner, S., Withers, G., Kam, L., Banker, G., Craighead, H., Issacson, M., Turner, J., Shain, W. IEEE Transactions on Biomedical Engineering 47 17-21 (2000). Chang, J. C., Brewer, G. J., Wheeler, B. C. Biosensors & Bioelectronics 16, 527-533 (2001). Wheeler, B. C., Corey, J. M., Brewer, G. J., Branch, D. W. J. Biomedical Engineering 121, 73-78 (1999). Craighead, H. G., James, C. D., Turner, A. M. P. Current Opinion in Solid State & Materials Science 5, 177-184 (2001).